This policy is valid from October 27, 2012 forward. This blog is a personal blog written and edited by me, Jamie Rohrbaugh. 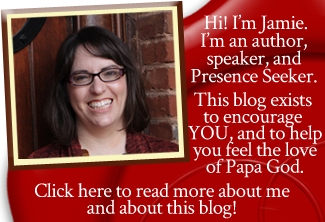 For questions about this blog, please contact me at jamie at fromhispresence dot com. This blog accepts forms of cash advertising, sponsorship, paid insertions or other forms of compensation. This blog abides by word of mouth marketing standards. We believe in honesty of relationship, opinion and identity. The compensation received may influence the advertising content, topics or posts made in this blog. That content, advertising space or post will be clearly identified as paid or sponsored content. When this blog includes links to products on other online retailers’ websites or to other blogs, those links may be affiliate links. If a reader purchases a product after clicking on an affiliate link, the owner(s) of this blog may receive some compensation from the other online retailer. My Canadian Government is currently drafting legislation …………Legalizing Doctor Assisted Dying” expected to be passed in June 2016. Like many families my family members father, mother,and sister have all passed away from terminal illnesses. Now I find myself facing an reoccurring cancer after 10 plus years remission. I readily admit that” Doctor Assisted Dying” is appealing having seen the terrible suffering of my family members. However, traditional teaching on redemptive suffering leaves me very confused. Thank you for your alternative perspective. I will lift you up in prayer, brother. Hi Jamie this is an awesome prayer.I thank GOD for you,and i thank HIM for JESUS.I am going thru a very hard time right now,i have no job nor any finances.I. don’t want to lose my home nor my car.I know my LORD and SAVIOUR didn’t bring me this far to leave me now. I’m sorry you’re having a hard time right now, Cynthia. I encourage you to speak Philippians 4:19 over yourself out loud. Father will answer you as you confess His promises in faith!